More 50 best chefs here. More one star chefs here. More Thai chefs here. First of all, growing up surrounded by delicious home-cooked meals. Indeed, Thitid’s mother and grandmother’s flavors has contributed largely to his passion in cooking. Yet, upon the completion of his Economics degree from Chulalongkorn University, he took off to USA to persuade his dream at the prestigious Culinary Institute of America. Most of all, the top-score graduate continued to receive an MBA in Hospitality from Johnson & Wales University. 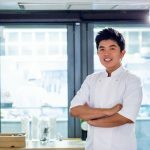 During his time in New York, Thitid has worked at several Michelin-starred restaurants, including Eleven Madison Park, The Modern and Jean Georges. Not only does he has passion in food, but his enthusiasm in wine also led him to become a Certified Sommelier (CS) from the respected Court of Master Sommelier. Indeed, he has brought home experiences and vision to elevate Thai cuisine and give it a stand among world’s leading cuisines. 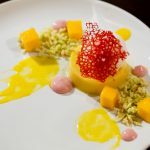 Since then, the rising young chef is running one of the most exciting kitchens in Bangkok, Le Du (#20 in Asia’s 50 Best Restaurants 2019). As well as an always-reliable comfort Thai food home, Baan. Furthermore, the name of the restaurant, Le Du, derives from the Thai word for season, “ฤดู”. It also reflects the ground of using seasonal produce. Thus, the kitchen also emphasizes the use of local, sustainable ingredients to ensure the freshest. True Thai flavors come with no costs from the environment and the future generations. “Thai food is special. It’s lively, it’s balanced, it’s full of flavors that are layered between one another. 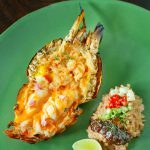 I’d like to see Thai cuisine evolve and Thailand stand among other world’s leading culinary nations.” – Thitid Tassanakajohn, a Culinary Institute of America graduate, says about his goal at the Bangkok flagship restaurant. 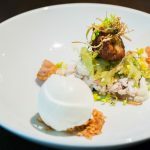 Moreover, amid the friendly atmosphere of the restaurant, chef Thitid serves fine plates of his Modern Thai-inspired cuisine with seasonal menu rotation. Indeed, his star creations include khao chae (fragrant iced water-soaked rice) in form of jasmine rice sorbet, alongside traditional side dishes, poached oyster with Thai rice wine sabayon and khao kluk kapi (mixed rice with shrimp paste) in form of brown rice risotto served with grilled prawn. 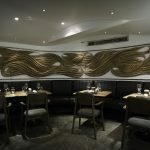 In addition the chef’s certified sommelier profile contributes to the wine list of more than 150 labels, which he curates to match with the challenging Thai flavors. Since its establishment in 2013, Le Du has garnered a number of recognitions from both local and international stages. This includes Top Tables award by BK Magazine (Top 10 from 2015-2017), Best Restaurants award by Thailand Tatler (Top 10 in 2017) and Asia’s 50 Best Restaurants (#20 in 2019). In the 2019 Michelin Guide, Le Du has been awarded with a first star!